au·to·crat [áwt? kràt] (plural au·to·crats) noun 1. ruler with absolute authority: a ruler who holds unlimited power and is answerable to no other person 2. bossy person: somebody who dominates others [Early 19th century. Via French autocrate < Greek autokrat?s "independent authority" < kratos "power"] -au·to·crat·ic [àwt? 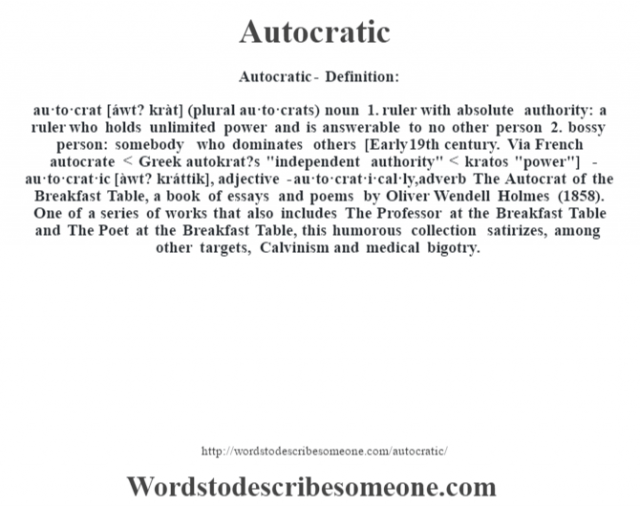 kráttik], adjective -au·to·crat·i·cal·ly, adverb The Autocrat of the Breakfast Table, a book of essays and poems by Oliver Wendell Holmes (1858). One of a series of works that also includes The Professor at the Breakfast Table and The Poet at the Breakfast Table, this humorous collection satirizes, among other targets, Calvinism and medical bigotry.